1) Quando ha deciso che sarebbe diventata una scrittrice? Mi è sempre piaciuto scrivere storie e poesie. Quando ero giovane ero pienamente convinta di voler fare la scrittrice, ma non ho mai ricevuto nessun incoraggiamento a scuola, così quando mi sono diplomata, dopo aver finito gli esami, non avevo idea di come poter realizzare il mio sogno. In quei tempi non tutti avevano accesso ad un computer a casa o a Google, così ho seguito i consigli del mio consulente scolastico e sono diventata una segretaria. Solo anni dopo, in seguito ad un incidente in cui ho perso buona parte della mia mobilità, ho ricominciato a scrivere, per cercare di distrarmi dal mio dolore. 1) When did you decide to become a writer? I’ve always loved writing stories and poetry. When I was young I fully intended to become a writer but I didn’t get any support at school and when I left, after my exams, I had no idea how to achieve my dream. Those were the days before everyone had access to home computers and Google and so I followed the advice of the career’s advisor and became a secretary. It wasn’t until years later when I had an accident and lost much of my mobility I started writing again as a way to distract me from my physical pain. 2) Quali delle due amiche, le protagoniste del suo romanzo, sente più simili a lei? Sicuramente Grace rispecchia molti dei miei gusti. Ascolto dischi in vinile, mangio molta cioccolata e non disdegno un bicchiere di vino. Come me, Grace è una persona molto ansiosa. Detto questo però, credo di condividere con Charlie lo stesso senso dell’umorismo. 2) Which of the two friends, the protagonists of your novel, do you feel more like you? Grace definitely has some of my tastes. I listen to vinyl records, eat a lot of chocolate and I do like a glass of wine! Like me, Grace is a natural worrier. That said I think I share the same sense of humour as Charlie. 3) Nel suo romanzo “La sorella”, l’amicizia è il fulcro attorno al quale si sviluppa tutta la storia. Lei crede che il valore dell’amicizia sia importante tanto quanto quello della famiglia? Cosa significa per lei l’amicizia? Assolutamente. Io credo che tra due persone si possa creare un forte legame che può durare un’eternità, senza che queste siano legate in modo convenzionale. A volte siamo più vicini a persone con le quali non abbiamo legami di sangue. I miei amici sono il mio mondo e l’amore può nascere sotto molteplici forme. 3) In your book, “The Sister”, friendship is the key on which the whole story revolves. Do you think that the value of friendship has the same importance as the family one? What does friendship mean to you? Absolutely. I believe two people can form a strong bond that can last an eternity, without being related in the traditional sense. Sometimes we become closer to people we don’t share blood with. My friends mean the world to me. Love comes in many forms. 4) Si è ispirata a delle persone reali per creare i personaggi di Grace e Charlie? E qual è stato quello più difficile da descrivere? Nessuno dei due si ispira a persone reali ma probabilmente Charlie è il tipo di persona che vorrei essere. Ha un coraggio che ammiro e il libro è stato scritto proprio per lei. Avevo questa idea di Grace che all’inizio depone una corona di fiori, così che I lettori potessero capire subito che Charlie era morta e che le sue ultime parole erano state “Ho fatto una cosa orribile, spero che riuscirai a perdonami”. Charlie mi incuriosiva molto e volevo scoprire cosa avesse fatto. Grace è stata molto più difficile da sviluppare, perchè volevo che avesse quella fragilità e vulnerabilità dovuta a ciò che aveva passato ma avevo anche bisogno che si inasprisse e scoprisse la sua vera forza interiore. 4) Did you inspire to someone real to create the characters of Grace and Charlie? And which was the most difficult character to portray? Neither are based on real people but I think Charlie is probably the person I’d quite like to be. She has a fearlessness I admire. The book was created for Charlie. I had the idea of Grace laying a wreath at the beginning and the readers learning Charlie had died and her last words being ‘I did something terrible, please forgive me.’ I was fascinated with Charlie and I wanted to know what she’d done. Grace was more difficult to develop. I wanted her to have that fragility, that vulnerability, because of all she’d been through but I also needed her to toughen up and find that inner fire. 5) Grace è una ragazza piena di ansie e paure che riesce a superare solo quando si mette in gioco e smette di appoggiarsi agli altri per ricevere aiuto. Lei crede che ognuno di noi debba fare affidamento solo su sé stesso per superare i propri limiti? Si, penso che siamo più forti di quel che crediamo. Una volta mi era stato detto che sarei rimasta per sempre su una sedia a rotelle, ma con un duro lavoro e una grande determinazione, ho recuperato parte della mia mobilità e attraverso la scrittura, ho superato una forte depressione causata dal mio incidente. Siamo tutti capaci di fare molto di più di quel che pensiamo. 5) Grace is a girl full of anxieties and fears that she only overcomes when she gets involved and stops leaning on other people to get help. Do you think that each of us has to rely only on himself to overcome his limitations? Yes. I believe we are all stronger than we think. Once it was thought I’d always be wheelchair bound but through hard work and determination I’ve regained some mobility and, through writing, I’ve overcome the clinical depression my accident left me with. We can all do more than we believe we can. 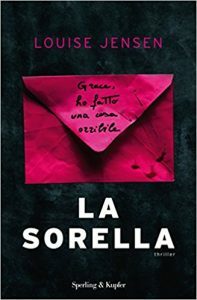 6) La Sorella è il suo primo thriller, come si è approcciata a questo genere? Scriverà altri libri simili a questo? Non ho mai pensato di scrivere un thriller, ho semplicemente scritto la storia che avevo bisogno di raccontare. Anche per il mio romanzo di debutto, non ho mai pensato a quale genere appartenesse, fin quando non ho iniziato a presentarlo alle case editrici e ho dovuto trovare una collocazione sul mercato dell’editoria. Ho firmato un contratto per La sorella e altri due thriller psicologici. Il mio secondo libro, The Gift è stato già pubblicato nel Regno Unito e il terzo, The Surrogates, uscirà presto. 6) This is your first thriller, how did you approach this kind of genre? Do you think you are going writing again books like this? I never set out to write a thriller. I wrote the story that needed to be told. Writing my debut I never once thought about genre and it wasn’t until I finished and I started to think about submitting it to agents I had to find where I fitted into the marketplace. I was offered a book deal for The Sister and for two further psychological thrillers. My second, The Gift, is already published in the UK. and the third, The Surrogate, is coming soon. 7) Un elemento classico nel genere thriller, che manca però nel suo libro, è l’omicidio. E’ stato difficile scegliere di non utilizzare la morte come “arma” per creare suspance nei lettori, ma affidarsi ad altri espedienti psicologici, come la scomparsa di oggetti o la comparsa di strani individui che seguono la protagonista? Non amo particolarmente le indagini poliziesche e la violenza, così ho deliberatamente scelto di non inserirle nei miei libri. La paura può presentarsi in moltepici forme ed è entusiasmante esplorare le varie strade che conducono ad un omicidio. Ad esempio, The Gitf, è la storia di Jenna che dopo aver ricevuto un cuore da una donatrice, Callie, inizia ad avere sogni e visioni che la convincono a credere che questa sia stata uccisa e non sia morta in un incidente come tutti suppongono. Ovviamente Jenna è determinata a scoprire cosa è successo a Callie e perché. 7) A classic component in thriller genre is the homicide, but in your novel it’s just missing. Was it difficult to choose not to use death as a weapon to create fear in your readers, but relay on other psychological expedients, like the disappearance of objects or the appearance of strange people who track the protagonist? I’m not a big fan of police procedures or violence so I do consciously choose not to include these in my books. Fear comes in many shapes and forms and it’s great to explore different avenues to murder. That said, The Gift, is the story of Jenna, who after receiving a donor heart from Callie, starts to have strange dreams and visions and becomes convinced Callie was murdered rather than dying in the accident she was purported to have died in. Jenna is determined to find out what happened to Callie and why. 8) C’è un genere che preferisce? Come chiediamo sempre nelle nostre interviste, le piace il thriller nordico? Leggo tutti i generi ma i miei preferiti sono i thriller e la narrativa commerciale. Adoro i thriller nordici, hanno delle atmosfere uniche. Ho appena comprato il libro di Agnes Ravatn, The Bird Tribunal e non vedo l’ora che arrivi il fine settimana per iniziare a leggerlo – ho sentito cose favolose al riguardo! 8) Is there a genre do you prefer? And, as we use to ask in our interviews, do you like nordic thriller? I read a variety of genres but my favourite are thrillers and commercial/literary fiction. I LOVE Nordic thrillers. I think they are often so atmospheric. I’ve just bought the paperback of The Bird Tribunal by Agnes Ravatn and am looking forward to the weekend when I’ll start reading – I’ve heard such fabulous things about it.